Motherwell scored twice at Tynecastle but conceded four to end involvement in this season’s Betfred Cup. We were unable to maintain the spirited first half performance in the second and paid the price. Main’s early penalty lifted the big travelling support but careless defending in our box from Bigirimana led to an equaliser 15 minutes before the break. Hearts grabbed their opportunity and dominated the rest of the game. Bowman’s terrific strike ten minutes from time gave us hope of extra time but we managed to concede in the 88th and 91st minutes. We started the game with four changes from the line-up at Pittodrie. Hartley was injured, Sammon could not play against his home side and Frear and Johnson moved to the bench. Filling the gaps were Bowman, Main, Cadden and Grimshaw. Luck was on our side in the first few minutes when we needed a Main goal-line clearance and the help of the crossbar to keep our goal intact. The opener followed a deep diagonal free kick from Bigirimana. McHugh’s header from the dead ball line was handled by Dunne and the penalty was awarded. Main drove low into the net. It was a perfect start. Bowman almost got a head to Zlamal’s parry but he seemed to be impeded as he rose. Bigi’s sloppy defending cost us as MacLean took advantage. Naismith should have sent us to the half-time team talk 2-1 down but he managed to head over the top when it looked simpler to score. We were outgunned and outplayed the the second half. Wave after wave bore down on Carson’s goal and Haring gave our hosts the lead after the hour. Our reply was to introduce Frear and Johnson for the struggling Bigirimana and Campbell. Play continued to take place in our half and we seemed unable to break out. Against the run of play we found a lifeline. 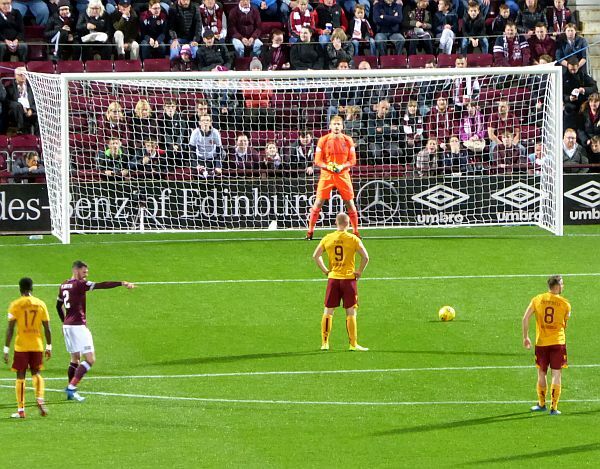 Bowman reacted first to a clearance and charged to the Hearts goal. From the angle of the box he let loose and found the net. The celebration took place in front of the ‘Well fans. It seemed that extra-time was inevitable but with less than two minutes remaining Lee swept the ball beyond Carson. A minute into added time Naismith created a one man breakaway to kill the contest.